Our minds can be so hectic that we can hardly keep pace with it. Our thoughts are everywhere and it’s difficult to concentrate. Even though we should move faster, we’re actually going slower. It’s not so much the actual work as it is the huge amount of thoughts that keep us overly busy and stressed out. With a calm mind we get much more done. 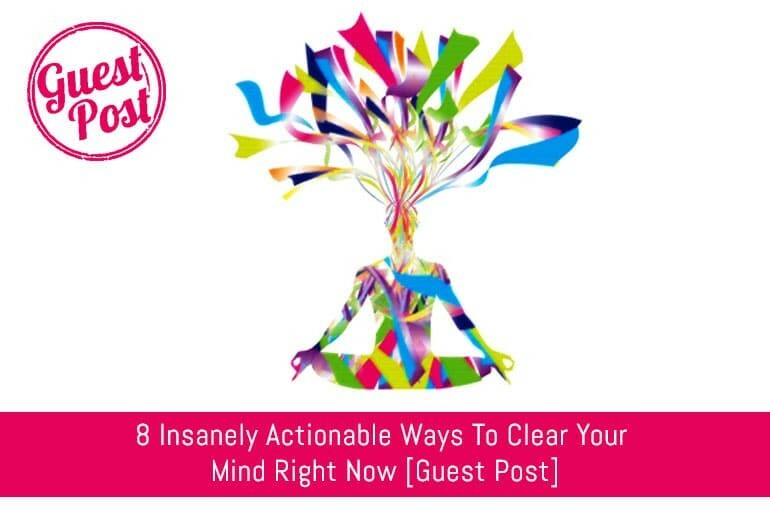 So when our thought process becomes chaotic, how can we step aside and take control again? Probably the best tip I can give you. It’s quick and super effective. It’s what Richard Branson does. He carries a notebook with him wherever he goes. We use a lot of energy capturing thoughts, trying not to forget and prioritizing them in our heads. And this we do over and over again. Simply start to write these down. It will free your mind from a great deal of activity and this ‘extra space’ can now be used to focus. So have a notebook or note-taking app with you all the time. An app like Evernote is a great tool to collect everything that’s on your mind. And get new ideas, details and to-do’s out of your head. Find a coworker or someone else you can talk to. Tell him or her what your obstacle is about or what dilemma you’re facing. People can help you on your way to find solutions you wouldn’t have come up on your own. Even when your listener isn’t contributing anything in particular, it’s great to have a soundboard. Just by saying your problem out loud helps you get to your breakthrough. A 15 minute run can make all the difference. Put on your running shoes, go outside and get your blood pumping. It always helps me. Whenever I have a ‘brain overload’, these quick 15 minutes move me out of there. Clarity comes, my mind is focused and I enjoy a boost of energy. Here’s why. Exercise reduces stress. It promotes the production of neurohormones that are associated with improved cognitive function, elevated mood and learning. Escape a hectic day by shutting your eyes for 15 minutes. It’s a powerful reboot of your system and thought process. A short nap in the middle of the day enhances alertness and concentration, elevates mood and sharpens motor skills. Even if you’re not completely gone, you’ll still enjoy its benefits. Ok, I love motorcycles. When I’m stuck and my thoughts are getting nowhere, I jump on my bike and make a fast 25 mile ride. It’s just the perfect way to reset my brain and have it function as it should. Doing the things you enjoy (but not for too long!) help our minds unwind. We don’t always realize how much our environment affects us. For instance, if it’s a stressful period at the office and colleagues are tense, it certainly won’t help you calm your mind. In that respect, it’s not a bad idea to leave the place and go to your favorite coffee shop to work from. A pleasant atmosphere helps you relax and regain focus. Instead of going around in circles, shift to a task that can be done on autopilot. Recurring chores like cleaning your desk, gardening or mowing the lawn don’t require much attention. They keep you busy and yet allow your thoughts to flow freely. Creative expressions like playing music, singing, painting, wood work are very helpful to give our mind a break. Our focus is shifted to a completely different discipline which forces us to fully engage in it. This distracts us (in a good way) from the subjects we were so occupied with. Christiaan Riemens started several years ago a successful eCommerce store in Belgium. Now, Christiaan blogs about his favorite topics on Improve-HQ: entrepreneurship, productivity and self-improvement.